Fear can cripple you. It’s a natural and basic survival mechanism, kicking in when danger is imminent, but in today’s society, that “flight or fight” impulse is going off all the time and it is damaging our health. 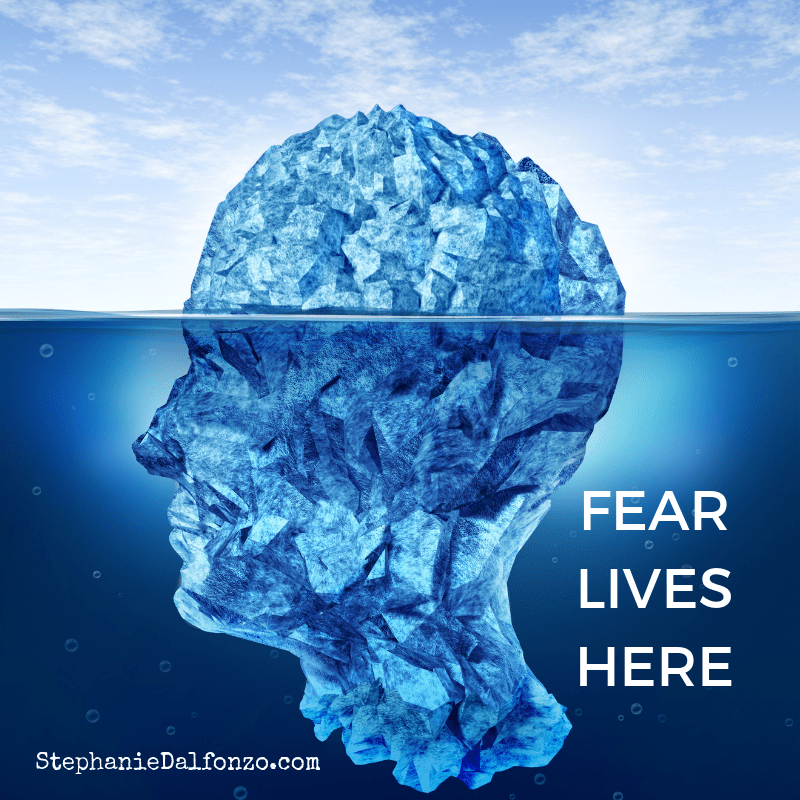 The thing about fear is it’s like an iceberg: the biggest part is under the surface, in the subconscious mind. In order to conquer fear, we have to get to the root cause or it’s just going to come back bigger and bigger. Albert Einstein said “You can’t solve a problem at the same level of consciousness that created it.” Our fears were created in the conscious mind and talking about it at the conscious level is not going to solve it. One of the reasons I am so successful at helping resolve fears and phobias is I have a unique ability to help you to easily access your subconscious mind and find the root cause. Just like a weed in a garden – you can’t just cut it down, above the surface, or it will grow back. An effective gardener knows they have to get into the dirt and pull the root out. And yes, sometimes you get a little dirt on your hands in the process, but the end result is beautiful… freeing up space for beautiful flowers, attracting butterflies. “He’s a very nice man, but I’m afraid he just wants to keep me in my problems”. Out of the mouths of babes! This from a 12-year-old boy who had been going to a therapist on and off for years and then came to work with me. After just a few short visits, when we had removed his fear of the dentist, he reported: “what was bothering me when I walked in was gone when I left”. This is a biggie! So many of us carry around the fear of being “found out” – that we are really an impostor. The interesting thing is it affects incredibly successful people just as much as “regular” folks. The late Maya Angelou had over 50 honorary doctorate degrees and she suffered from Impostor Syndrome. So does Meryl Streep, Will Smith and Supreme Court Justice Sonia Sotomayor! The 2nd most watched TED Talk of all time is from Amy Cuddy (Harvard Business School Professor and Social Psychologist) is on, you guessed it, Impostor Syndrome! She shares research on how our own body language can affect how we feel. I went a lot deeper into Impostor Syndrome and ways you can deal with it here. Just the other day a friend said “Don’t hug me, I am in excruciating pain” as she entered my home. She had “tweaked” her back and could barely walk. She then went on the tell me about all the fear and anxiety she’s been experiencing. I sent her a link to “Healing Back Pain: The Mind-Body Connection” by Dr. John Sarno, MD. In this groundbreaking book, he promises the elimination of back pain without drugs, surgery, or exercise. How is this possible? By getting to the root cause! He says that ALL back pain is rooted in emotions. He claims that many people have eliminated their back pain simply by reading his book! When tax season comes upon us, how many of us are afraid we are going to get “caught” because we haven’t paid taxes for 5 years? How about that pile of bills and late notices that you are too afraid to open? Financial fear manifests itself in so many ways: being afraid to ask for a raise, in being afraid that you will end up as a bag lady on the corner with your doggy and kitty… If you share this fear, you are in good company: Lily Tomlin, Gloria Steinem, Shirley MacLaine and Katie Couric have all reported suffering from this fear. “I feel like I got punched in the gut”. Take a moment and think about it – when you were in a really fearful situation, where did you feel it? A majority of the time I ask clients where do they feel the fear in the body, they say “my gut”. It gets lodged in there and can manifest in some pretty uncomfortable and awkward ways. Several years ago, a very successful businessman came to me for help. He had a debilitating fear that he was going to literally poop his pants while driving. It was wreaking havoc in his life – he knew where every public bathroom was in a 50 mile radius, couldn’t get in a car with someone else driving. Imagine the relief and freedom he feels now, after we got to the root cause, and he can simply live his happy healthy life! In 2017, the weight loss industry raked in $66 billion!!! If our obesity epidemic was just about the food we eat, that industry would be out of business! I recently had a woman call me to work on weight loss and “oh by the way, I’ve been dealing with some anxiety and fear lately”. I explained to her that I wouldn’t work with her on the weight loss, that I work at a much deeper level – to get to the root cause, which many times is driven by fear. Once the fear is gone, the pounds can come off. In the 10 years I had a hypnosis practice, I helped hundreds of people successfully become nonsmokers. It was never about the cigarettes! It always boiled down to finding out what the root cause was and healing it. We dealt with old fears that had been buried deep. The clients that were ready to do the healing work are my biggest success stories. The ones who wanted to come in and have me “fix” them were not. The fear of losing “my best friend” is far greater for some people than the fear of what it is doing to their health. What is the true cost of your addiction? Is it financial? Is it how it’s impacting your job? How about your relationships? How about your self-esteem? Fear drives our addictions! We’ve now become a society addicted to our social media devices – we are desperately afraid of “missing out”. No matter what the “drug of choice”, many times addicts are very fearful people. As the fear drum pounds louder and louder, the addict feels compelled to use more to try to drown or numb out the fear. Unless and until you are ready to face the fear, it will keep growing bigger and bigger. This was a big one for me. Back in the mid 90’s I found myself having serious sleep issues. I’d wake up in the middle of the night going through my “what if” list. If there was something I could worry might happen, it came to pay me a visit at 2 am. My doctor prescribed Ambien and wow, it worked – for a short time. Soon enough, I was back to my “what if” song, with a new twist: “What if I take the pill and it doesn’t work!” Until I was ready to do the healing work I needed to do, I was literally a walking zombie. CLICK HERE to learn how beautiful Sarah went from fear of flying to skydiving! You don’t have to live like this anymore. If you’ve tried everything, if you are tired of living a life of fear and are ready to make a change, let’s talk! Click here to schedule a chat.